This game is a graphical adventure where you play the role of a programmer who wants to jump off a building. Try to find out why he is doing that, what’s happening and who this mysterious character is. In the game, you can choose different options and they will change how the adventure develops. Unfortunately, this game is only available in Spanish. Are you working on an MSX game, or even have one finished? Please consider to submit your work as an entry for this legendary MSX contest, and have the guarantee of a wide as possible audience, gain the attention of potential cartridge producers and even contend to win some prizes! But, it is better to add the English language and the related selection option, obviously. Very nice ... But I don't understand why a game presented at an international contest is in only available in Spanish (perhaps the authors will make a later conversion ?). Come to think of it, the rules at MSXdev should include one that impose English as the langage of the game. Interesting... But seriously, that font used is really confusing and visually tiresome to read, at least for me. I see a very interesting game, a graphic adventure as in the past. About the language, I understand that many people prefer English, but my personal opnion is that it is not a mandatory requirement, everyone with their time does what they can and I think that if the community shows interest in it, it is always possible that the programmers they cheer up and translate it into English. Anyway, Spanish is one of the most spoken languages ​​after Chinese. If we do not complain that it is not in English, the Chinese could also complain with all the right because they have the language that most people speak on the planet. I do not want to discuss but I do not think that English has to be forced, but a very valid option to reach more market if they want more when the rules do not put anything of the language. Roughly in order of user base, the primary languages would be… Japanese, Spanish, Dutch, French, Korean, Portuguese, German, Italian, Russian, Ukranian, English… did I forget any? However although English is not the primary language in the most popular MSX territories, it is the most common second language I think. So if a wide target audience is the goal, English is a good choice. I think that English should be strongly suggested, but I don't think it should be mandatory. My reasoning is that the goal of MSXDev is to stimulate development of new games. So, given that in Spain we are usually pretty bad at English (hahaha), I think that making it a requirement could discourage some developers (like the case of this game). I have started playing it already and it feels pretty good! It's a choose-your-own-adventure style game with an interesting story. This is the correct attitude! it is a participative attitude and a solidary reasoning. but you can not say that not doing it in English is penalized. I didn't say it should be, I said it's the author's choice. So I'm agreeing with you (although I prefer English). They would immediately get on my good side if they said I'm good looking. English is not mandatory, but we cannot compare it to Spanish or Chinese, since these are primary languages. If joesg needs some help, we all can help translate it to English, since it's easily the second language for most of us here and globally. 30 years ago I bought Konami's "Shalom". It was all in Japanese, a language I can't read. Yet, I blindly tried all options in its menus in order to advance in the game. It was Knightmare III and I had to play it no matter how! Needless to say that, after hours of blind game, I had to return the game as I couldn't play it properly. Well, I can't type japanese characters in my computer, and 30 years ago there was no Google Translator. If I had "Shalom" in a language with latin alphabet (so I could type normally), and I had Google Translator, God knows that I'd written all texts on it in order to find out it's meanings and unveil the game's mysteries. A lot of us, non-Japanese people probably also have beaten, or at least went far in for instance SD Snatcher and the Xak and Ys games, at the time when they didn't receive a fan-translation yet. But like Shalom, these were a different type of game, with more emphasys on action. Even if I can reasonably understand basic Spanish, and "C.C.R. Anexo 1 El Algoritmo" looks very cool and has an interesting premise, for me the threshold is just a bit too high to even try it out. It's not because of disrespect for the efforts of the people who have obviously put a lot of work in creating it. It's just because, especially as we're generally all a bit older now and have less time to delve deeply into a game, I'm afraid this project will not get the the praise which it possibly deserves as long as it's not as accessible for those who aren't as proficient in Spanish. In the MSXDev site, this is stated: "all entries must be accompanied with the required game instructions written in English". I don't see why the manual and not the game should be written in english. In an international contest it's logical requiring english language. Nowadays you can easily find somebody to help you translating the dialogues... even using google translate, as the last option. Anyway, if you don't want to do it, you can always release your game outside the contest. Anyway, Spanish is one of the most spoken languages ​​after Chinese. Spanish has a bit more native speakers than English, but way less who understand it. That's globally. That's not what the MSX scene is about. In here we have MSX country Spain delivering the native speakers. The rest of the major MSX countries don't. Some might have had some Spanish lessons at school by their own choice, but way more had obligatory English lessons in stead. I wouldn't even be surprised if the majority of the MSX users are native Japanese speakers. You can't force a coder to use English. But by not using English, sharing the product internationally is not really helping the coder either. It's a bit of the same with Japanese. So many, probably, great games have only been played by the Japanese. As someone who actually had entered in MSXDev, I'd say that the more important problem is that there were like 3 votes total last year for all the entries. I believe that MSXDev was created to encourage more games being made, especially niche ones (the really good ones don't need a contest and can easily be sold outside MSXDev). MSXDev is a good platform for letting games known to the rest of the world. If any game developers can use it to get news of their game distributed, that's a good thing. Perhaps MSXDev needs more games that are not in English. (No, I don't speak Spanish, and I very likely won't play this game, but don't let me stop you making games in it.) I don't mind if there are more games released in other languages. Obviously, my games are in English because I make Spectrum games too (I can speak some other languages, too). One last thing, I do think that the jury scoring part should be done only on English entries. First, we don't expect the jury being fluent in every language, and secondly, it would be unfair if an entry got more points than some other entry because the jury knows Spanish and not Japanese, for example. how many of the judges for MSXDev speak Spanish? I wonder how hard it would be to automatically extract all the text on screen in openMSX, and then auto-translate it via Google Translate and provide them as OSD subs. Might take up a bit too much space with this much text though. Anyway, we've done crowd-sourced translations here on MRC forums before, so why focus on a problem rather than a solution? If the devs can provide us with a dump of all the text, those capable of both Spanish and English could start with an initial translation, and those proficient only in English could still help polish the text. A translation is on the way In fact, I have finished translating all the game texts. As soon as I have tested all the possible paths, we will release the English version (C.C.R. 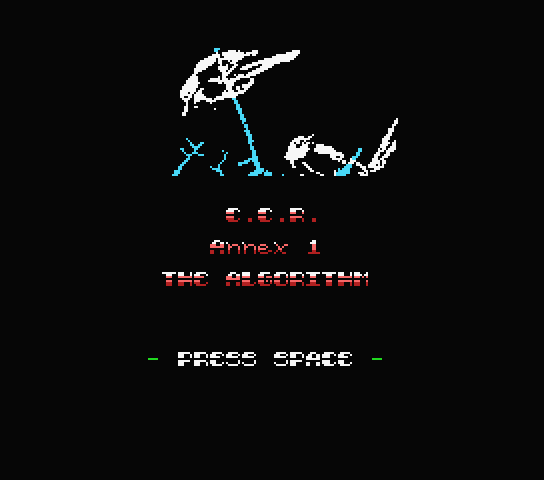 Annex 1 The Algorithm). That is great news ListoMefisto! I look forward to trying it, and I'm surely not the only one.